Researchers at The Hong Kong Polytechnic University have developed a computerized knitting technology that creates fabric circuit boards (FCBs). 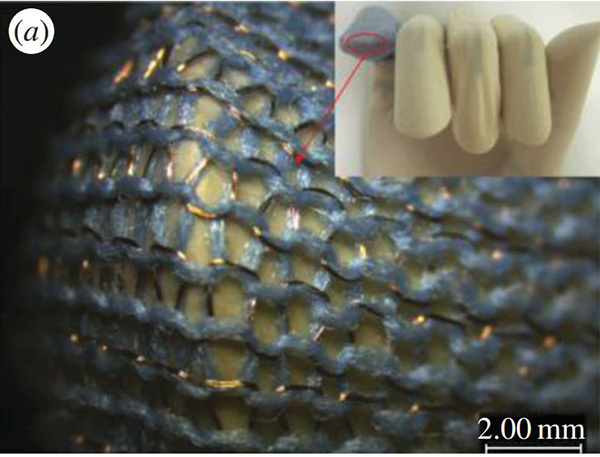 In their efforts, the researchers combined electrically conductive fibrous metal materials with normal fabric materials using new computerized knitting technology. The result is a three-dimensional material that can withstand stretching, washing and drying, strong forces and twisting. With this new technology, it is possible that an entirely new line of products will surface. The mechanics would offer wearable devices that are actually a part of clothing. FCBs can direct electricity from one part of a garment to another and offer mechanical support even as they electrically connect discrete electronic components. They can create an entire shirt, or just a portion. This would allow for solar collection or the use as a multi-sensory device, recording heat, perspiration, heart rate, etc. The researchers say that their FCBs are ready for use. This new technology affords three-dimensionally deformable, highly stretchable, permeable, durable and washable fabric circuit boards. Allison has had a lifelong interest in multiple facets of design. Growing up between a sewing machine and a sketch pad, she went on to fine-tune her skills through studies in fine arts and fashion design. Upon entering the design/build industry, she continuously researches trends in various markets, including retail, hospitality, exhibitory/events, interiors and architecture in order to provide valuable educational and inspirational resources to clients. ← Zippers: Function or Fashion?